MRC-KU concluded MOU on Mg alloy research collaboration with Division of Materials Engineering, The University of Queensland. The 1st KU-UQ Mg Workshop was held. An MOU on Mg alloy research has been concluded in order to strengthen research collaboration between MRC-KU and Division of Materials Engineering, The University of Queensland, Australia. Kazuki Takashima, Professor, Shinji Ando, Professor, Tsuyoshi Mayama, Associate Professor and Hiromoto Kitahara, Assistant Professor attended the workshop. The attendees made presentations on Mg alloys and exchanged their views and opinions on Mg alloys research. 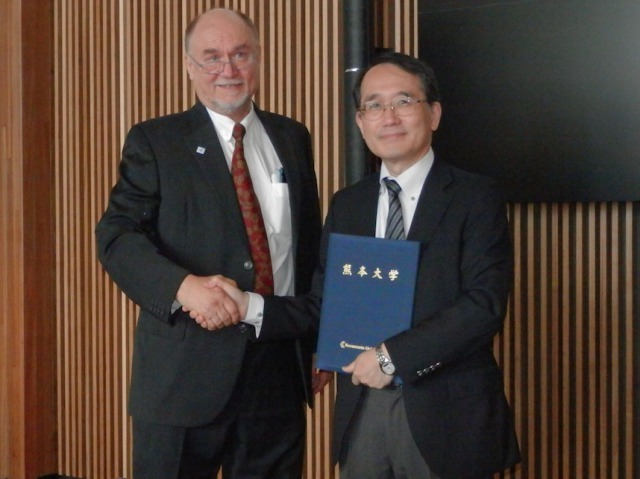 Posted by mrc.ku｜News｜Comments Off on MRC-KU concluded MOU on Mg alloy research collaboration with Division of Materials Engineering, The University of Queensland. The 1st KU-UQ Mg Workshop was held.